Three main areas that you should definitely see at Union Station are the Great Hall of the old station building, the train platforms at the back with their imposing arched canopy, and the plaza at the front with its fun interactive fountains. I think the great hall is a really intriguing public space, with quite a unique feel to it. 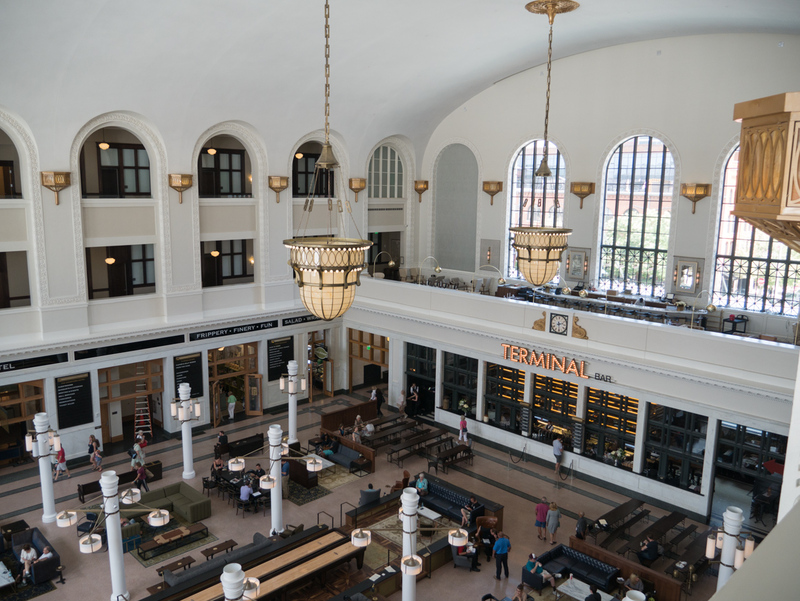 It’s a train waiting room and a comfortable lounge, a food court and an elegant bar, a hotel lobby and a thoroughfare. It has grand historical architecture but also feels very welcoming and accessible. Preservationist and developer Dana Crawford said it would be “Denver’s living room” and it does feel like that, but is all these other things in addition. The Terminal Bar serves 30 different Colorado beers, plus a range of wines and spirits. 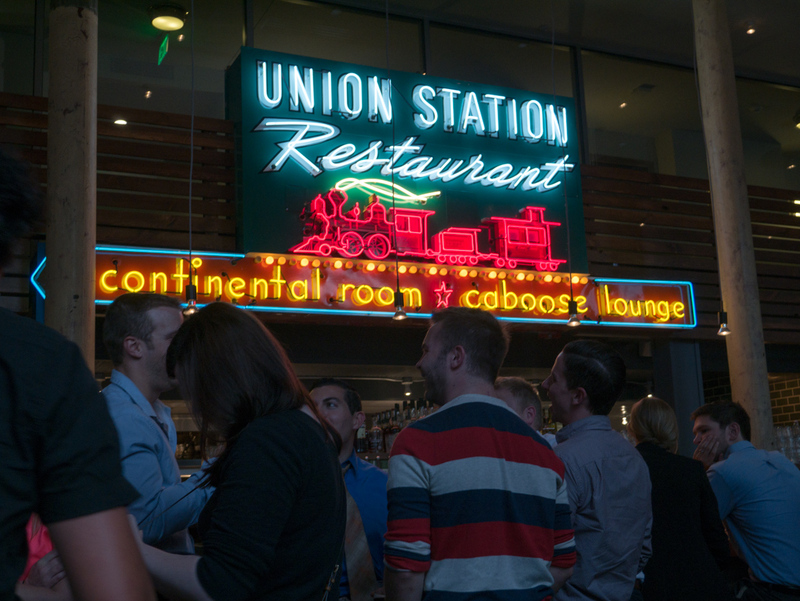 You can stand in line at the old train ticket window to buy drinks to consume in the great hall, or they have dedicated indoor and outdoor seating space. The beer flight is a great option to sample a range of interesting beers. ACME Burgers and Brats offers gourmet versions of these items, such as their elk jalapeño cheddar brat! They have no dedicated seating, but you can take their food to eat in the Great Hall, or order it at the Terminal Bar. Fresh Exchange offers a range of fresh sandwiches and wraps – they have indoor seating of their own, or you can take them to the Great Hall. In addition to these offerings off the Great Hall, there are four sit down restaurants, two more casual and two upscale, all of which have indoor and outdoor seating, plus the upmarket Cooper Lounge on the mezzanine level. Snooze is a great place for breakfast and brunch. Many Denverites probably know them as they’ve been serving great breakfasts in a fun environment in the Ballpark neighborhood and a few other locations since 2006. 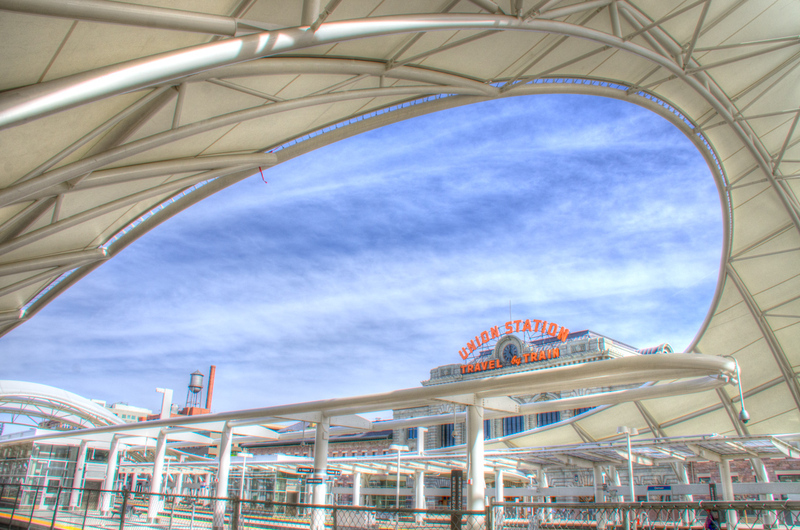 Union Station is their latest addition. I love the Kitchen Next Door “Community Pub” for its down to earth atmosphere and reasonable prices for gourmet comfort food. It’s part of The Kitchen family of restaurants started in Boulder by local entrepreneur Kimball Musk. Its fancier cousin The Kitchen is just two blocks away up 16th Street, and is also well worth a visit. Stoic and Genuine is a high end seafood restaurant owned by renowned chef Jennifer Jasinski, who also owns Rioja, Bistro Vendome, and Euclid Hall. They fly in fresh fish, oysters, lobsters and more every day. The Cooper Lounge is an upmarket cocktail bar on the mezzanine level. You have to check in at the reception desk in the Great Hall, near ACME Burgers and Brats, to get up there. They serve a limited but high end seafood menu from Stoic & Genuine – oysters, shrimp, lobster and caviar! You should definitely make sure you take the time to step out at the back of the station to see the train platforms and the impressive arched canopy. As you walk around you get a variety of interesting views from different angles, so do explore! It’s also worth going downstairs for a quick look at the new bus station, which is clean and modern and more reminiscent of an airport than a typical bus terminal. Also make sure you check out the plaza at the front, by Wynkoop Street. This has a really good atmosphere on a nice evening, with lots of people eating outside, and kids playing in the fun interactive fountains. 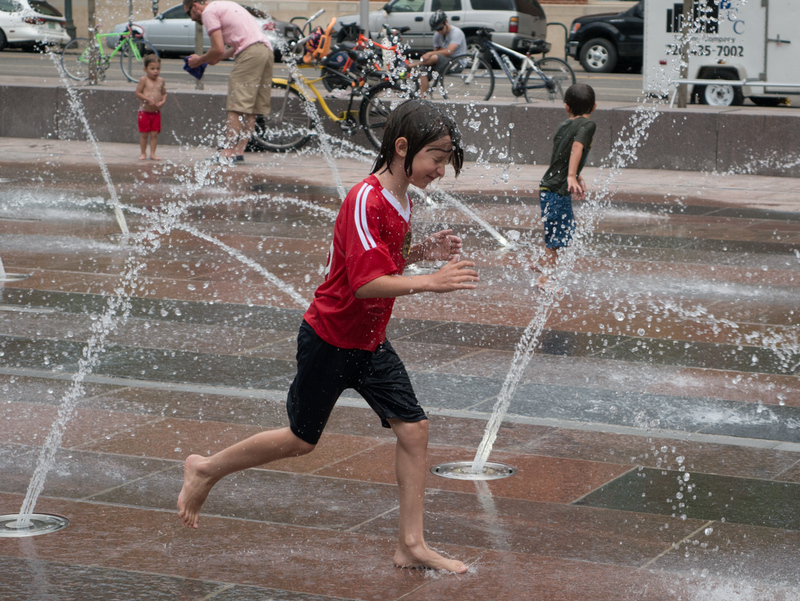 Kids love the fun fountains – plan for them to get wet!